Now that Stacks 3 is out of beta testing and available to everyone we thought it would be a good time to release a fun new stack that made use of some of Stacks 3's new features. I'm excited to show you all our newest stack -- Timeline. So without further ado, let's take a look at what Timeline is and what you can do with it. Timeline is a fun way to build out beautiful, chronological lists in a very visual way. It allows you to present your information to your visitors in a linear manner, and do so with style. Timeline comes with several pre-built styles as well as a plethora of color pickers that make it easy to create a timeline that matches your site’s theme. It also includes several fluid animations for both the timeline badges and content bubbles. Much like Bricks 2, the Timeline stack benefits hugely from some of Stacks 3 newest features for developers. Adding Timeline items is as easy as clicking the small blue plus sign at the bottom of the stack, and rearranging items is just a drag-and-drop away. 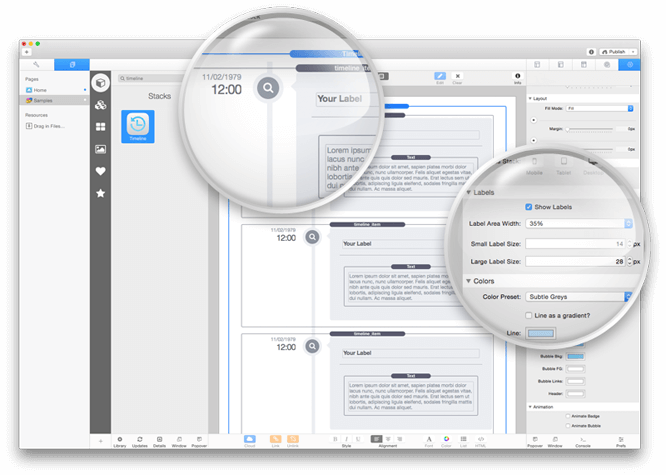 Timeline makes creating a beautiful, complex layout a breeze. Be sure to have a look at the Timeline product page. We outline all of its features as well as walk you through those features in our overview video. Looking for that perfect stack? We offer a wide variety of other plugins for Stacks as well, and are always working on new stacks as well. Give them a look.